This was such a nice surprise! My sister-in-law gave me a gift subscription to Universal Yums for my birthday, and the first one arrived in May. This is a bit of a belated post since I wanted to get the chance to try everything before posting about it. 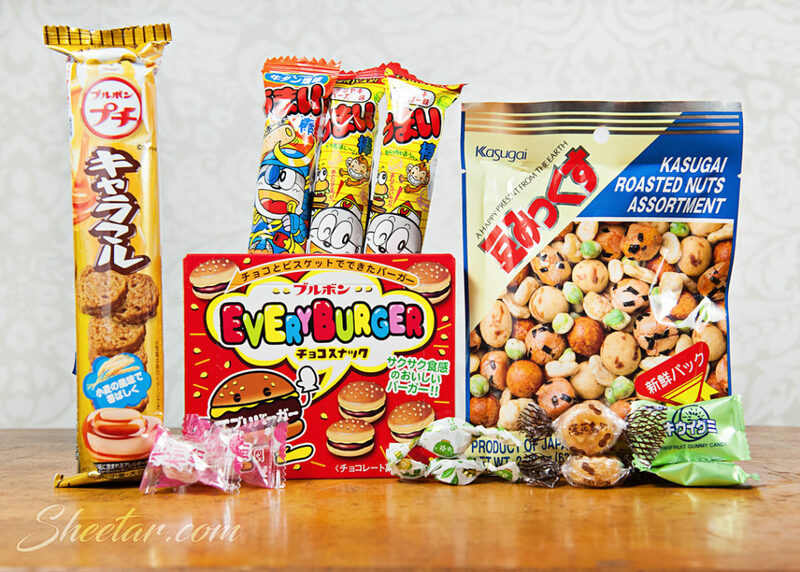 This month’s theme was Japan, so all the snacks came from Japan. All of these were new to me except the kiwi gummies (already a favorite), so it was neat to try new things! I’ll try to go left to right in the photo and descriptions below. I can’t really assign a dollar value to these since this was a gift, but the novelty of trying new things is definitely worth it! Bourbon Petit Caramel Rice Crackers – These were tiny round rice crackers that tasted a lot like buttery caramel. They were very sweet and very good, and that little sleeve was just enough without being too much since they were rather richly flavored. Ribon Nama Ume Candy – Inside the sweet, hard candy is a center of salty pickled plums. I found that I did like the combination of salty and sweet, but the salty inner core was just a little bit too salty for my tastes once the candy was all gone around it. I liked them better if I cracked open the center and chewed it along with some of the candy instead of letting it melt down all the way to just the center. Everyburger Cookie – Cute little cookies that look like burgers with cookie buns and a chocolate layer in the middle. This was definitely my favorite item out of the box! Umaibo Teriyaki Burger and Gyutan – These little packets held a puffy cheese-curl textured tube that was flavored with either Teriyaki or “Gyutan” which is apparently beef tongue. The Teriyaki was definitely teriyaki and Gyutan tasted like a hamburger, and both were really good. Sakuma Matcha Milk Candy – Oh boy, these were so good that I’d actually consider trying to find these again. The candy is flavored like Matcha tea with milk, and it’s a nice hard candy that makes for a great treat. Kasugai Roasted Nuts Assortment – The information booklet said these were supposed to be a Mame Mix and featured a picture different from the package I received. I think they’re still basically the same thing from the description though. This is probably my least liked item from the box since there’s a lot of seaweed involved and I found them much too fishy for my liking. Even the bits without seaweed still tasted fishy since the seaweed had kind of infused the whole package with the flavor. But hey, part of the fun here is trying something new, and while I did like the texture/crunchy pieces in here, I just wish it could’ve been made without the seaweed. Rakka Ame Candy – It’s a peanut flavored hard candy with bits of peanuts in it, so I definitely liked these! Kasugai Kiwi Gummies – These are an old favorite I used to buy all the time in a variety of different flavors. The gummies pack a huge flavorful punch that tastes exactly like kiwi, and the texture is just right. Overall, this is a fun box to try! Even the things that I didn’t quite like as much as the others, they were still things I might never have tried without the box, so the experience of trying something new was all part of the fun. I’m very glad to have received a gift subscription to this one and am looking forward to June’s theme which is Mexico.